As a young girl, her devotion to the Infant Jesus of Prague started. She dreamt of visiting Prague one day to honor Him for the many prayers and wishes granted to her. Finally, the dream came true. She found herself at the Shrine of Infant Jesus of Prague. In Prague, she wanted to buy a statue, a replica of Infant Jesus to bring back home to Vancouver, Canada. She then asked the priest and the nuns to bless it. When it was consecrated on the altar, she prayed that may His miraculous powers be extended to the statue she’s taking home. That was twenty years ago. Susan has seen the power of healing, miracles and answered prayers of other devotees through the Infant Jesus. It became her mission to go to Prague and get replica statues, have them blessed and prayed over. She brought these statues to many places in four corners of the world. The feast of Holy Infant falls in the third week of May. The call of Susan’s devotion is so strong that she hasn’t missed this sacred event in Prague. Usually, the nuns of the shrine are responsible for changing the garment of the Holy Infant. However, for the past two years, Susan was allowed to change the outfit. It was a tremendous honor and privilege given to her. One day, Susan had an idea about how to bring relics of the Holy Infant. When she visits the shrine, she brings materials to wrap around the Holy Infant while the priests and nuns perform their veneration. The fabric then is cut into tiny pieces and attached to the prayer cards. Relics are essential to the Catholic religion. It’s impossible in the history of humanity to exist without relics. 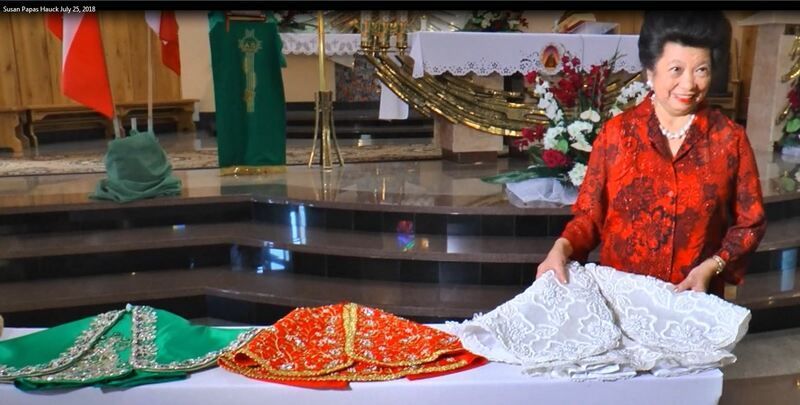 Recently, Susan sewed three gowns for the Infant in Jodłowa, Poland: Green, Red, and White. The white material is made from her wedding gown. She has been married for 44 years. On her wedding day, usually the bride carries a wedding bouquet; instead, she carried a bible and a small statue of the Infant Jesus. That’s why it’s so meaningful for Susan to use her wedding gown material for the Infant. On this video, Susan is joyfully dressing the Infant in the red gown. She found her calling. This entry was posted in Inspiration and tagged Devotion, Faith, Infant Jesus, Infant Jesus of Prague, Story, Sunday Snippet, Susan Papas Hauck by Perpetua. Bookmark the permalink. What a great story. It is wonderful the way God gives us such individualized tasks to do in this world. Susan, what a gift God gave you to serve and to bring the Infant statues for those who can’t travel. So Blessed to have met you in San Diego and you have a very giving heart. The Infant did good to select you to do His work. Your garments are Beautiful and fit for a King.